Source : KM for me… and you? The rise of Knowledge Management (KM) in the 90’s was, according to me, tightly connected with project management. Seen as a response to an accelerated competitive environment, project management started to change the way organizations use knowledge. In the years 2000, Internet and networking tools, by creating a real collective mind, deeply changed the practice and speed of knowledge creation and management. From a hierarchical and analytical way of dealing with knowledge, we start moving to a more fuzzy and intuitive knowledge management pattern. I think, in the next decade, two main trends will be essential : instant everywhere access to quite all explicit knowledge will shape a new scheme of interaction between humans ; and thanks to neurocognitive science research progress, we will upgrade our understanding of the tacit dimension of knowledge and its unconscious part, seen as a core competency regarding creativity and innovation. What we could call : “KM compass” in project management is “to aim locking a degree of freedom only when having raised optimal Knowledge level”, as put by Midler (1993)[i]. Project management and its core teams patterns focus more on multi-dimensional shared visions and ability to create a learning trajectory. Dassault System 3D conception software’s efficiency is based on this statement : to see the same things ! To leverage competitiveness i.e nowadays largely an ability to create competitive advantages through innovation, companies can thus turn to this spiraling model of product conception. Arising against classical, more sequential, profession based processes where the emphasis is put on field expertise, the spiraling model aims to speed up interactions as the best shortcuts to support innovation. Another channel is to learn from creative industries their manner to manage creativity and talents. Paris (2011)[ii], for instance, focuses since many years on how to create organizational environments and disposals to foster business oriented creativity. First, you have “to know what you know” and this is really a huge problem. That means creating a kind of datacenter automatically alimented with business datas, in which your teams can share information and knowledge. But, as put by Cholle (2011)[iii], intuitive intelligence (80% of our cognitive process is done by our unconsciousness) is as important as rational and analytical approaches. So, your KM needs to care about the tacit dimension of knowledge, uneasy to catch, difficult to deal with, but critical when regarding performative interactions. One of the major hurdles to overcome is surprisingly just reaching a clear diagnosis about KM potential, as we generally make confusion about data, information and knowledge on the one hand, and on the other hand, underestimate the role of tacit knowledge. Then, as knowledge is power, the risk of sharing and its organizational impact in terms of management is always a concern. But the biggest risk is certainly to avoid the KM subject. The best way to address KM stakes is may be to rely on external tools specialists, creating a partnership that has three advantages : 1) staying neutral regarding power distribution, 2) improving maturity of KM schemes and disposals, 3) having a clear vision of the “self-acting” dimensions of tools when introduced into organizations - and that’ s essential ! To improve our skills to tap into things we know but we don’t know we are knowing”, I’ve proposed a matrix to understand how to leverage tacit knowledge in business situations, by paying attention to the type of managerial mandate (Barbier,2005)[iv]. This model was applied for instance to French clusters (Barbier, 2009)[v]. In France, land of Descartes, we are certainly overestimating explicit knowledge. We could certainly learn a lot from oriental civilizations and even from so called “ancient primitive societies”. [iii]Cholle F. (2011), The intuitive compass : why the best decisions balance reason and instinct, Wiley. [iv]Barbier J.-Y. (2005), Breaking the tacit dimension : the double helix of knowledge creation, Passion for knowning Colloquium, Trento, Italy. [v] Barbier J.-Y. (2009), « Comment modéliser la dynamique collaborative des pôles de compétitivité pour orienter les politiques publiques : une approche par la connaissance tacite », XVIIIe Conférence Internationale de Management Stratégique, Grenoble, 3-5 juin. My vision on the future of Knowledge Management is one that sees it integrated in the normal, everyday operations of all organizations and that uses supporting technology efficiently and effectively. The trends today seem to be towards the socialization of knowledge; I think that will continue over the next few years. 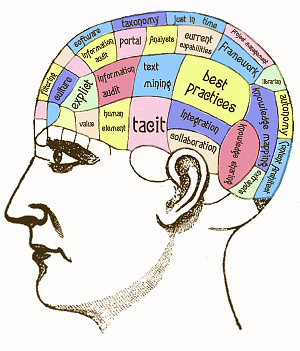 The benefits of Knowledge Management are widespread but often intangible and hard to measure. This makes Knowledge Management a difficult activity for many to understand and implement. This intangibility is one of the reasons why, in the early years of Knowledge Management becoming a discipline, IT vendors and indeed organizations latched on to technology as the solution to the problem. Technology makes Knowledge Management tangible, people could see it and understand it, but technology by itself is not the answer. Implementations that focused on technology largely failed as Akhavan (2005), et al identified in article entitled, “Exploring Failure-Factors of Implementing Knowledge Management Systems in Organizations.” Technology is only an enabler. It is the people and processes that are critical. It is the intersection of all three: People, Process, and Technology that leads to the most significant payoffs and benefits for organizations. One of the biggest benefits of any Knowledge Management system is making available information and knowledge from the rest of the organization. Whether we are talking about business intelligence, CRM, expertise location, records management, enterprise content management, portals, blogs, collaboration, or any other KM technology, they all make knowledge available to improve consistency and standardization in processes, and enhance decision-making. This often results in staff delivering better quality products and services as they are not re-inventing the wheel every time they have to do something. Understand what problem the organization needs to solve/resolve and consider how to align people, process, and technology with the organization’s strategy in order to solve the challenge/problem that was identified, using knowledge management activities. Silos are created when too much emphasis is placed on a single activity whether it’s the Technology, People, or Process to the exclusion of the other two key success activities. For example, focusing on technology and ignoring the people and process part of the programme. Technology is easy to focus on, but it only addresses one of three keys to success. Developing and implementing people and process initiatives in conjunction with the technology will enable the success of the over-all initiative. By ignoring people and process activities, an organization will have another technology platform that is underutilized. There is always a risk of people/groups not participating, i.e. they will create their own local solutions or will just not participate and that they will continue in their less efficient and effective behaviours. Lack of participation also results in a sub-optimal solution being rolled out, having user input is critical to designing a solution that will be user-friendly, and address pain points helping rather than hindering people’s ability to do their jobs. Loss of momentum occurs when the excitement, enthusiasm, and interest built up in the requirements phase of the project is lost due to delays in selecting and implementing the technology or otherwise moving forward with the KM initiative. At the early stages people are interested and involved, but it is easy for them to lose that focus and commitment /enthusiasm and transfer it to other initiatives. Not identifying someone with the capacity, commitment and passion to lead the initiative. The KM initiative is not technically difficult but there are significant risks around how it is led, developed and implemented because people have to change their behaviours; facilitating/championing this change requires passion and commitment on the part of the leader. It needs to be someone who has credibility with both management and front-line workers. It also needs to be someone who is senior enough in the organization to have positional power, i.e. someone with influence and visibility. Losing the link to the business case is a risk, especially when KM has been viewed as a quick fix for a problem or if a solid business reason for KM is not established. It is critical that the focus remains on solving the business issues that gave rise to this KM initiative in the first place. Losing that link will result in a lack of direction and potential failure of the initiative. The culture of the organization can result in implementation issues and failure. The culture must be taken into consideration and factored into in the change management activities for the programme through communication, and rewards and recognition initiatives. There is a risk that sponsorship of the initiative will not be clear and directed. Should the programme lose its sponsorship or that sponsorship wane, the programme will be in jeopardy. It is important that people understand the management team supports and endorses the initiative. Yes, and depending on the culture of the organization, and the individual teams within the organization.